Delve is a platformer-management game about a professor who, despite dangers, refused to leave their team's submarine after discovering an ancient relic. 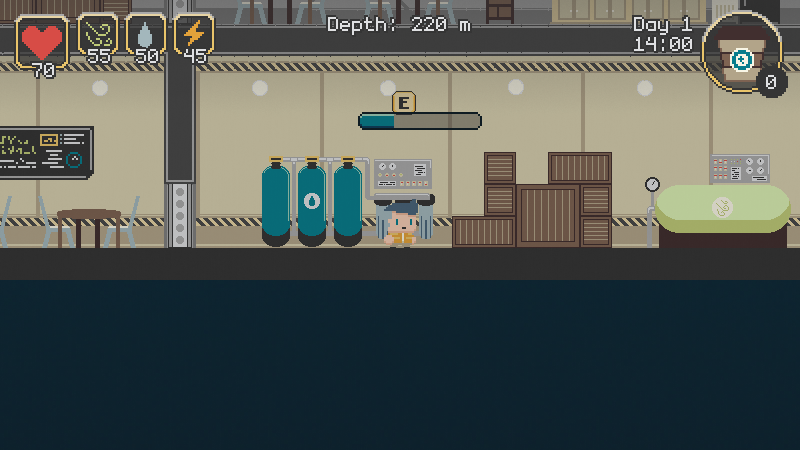 Help the professor survive for 3 days by performing all sorts of tasks, from maintaining power in the submarine to keeping yourself from getting hungry. This game is a submission for both gm48 and LDJam 41. Made by Gofico. At the beginning it was pretty hard to understand what did what and how to play in general, but once I got through that wall the game became a lot more enjoyable, and it was just challenging enough to not become frustrating, even though it was really close. The things you can interact with tend to blend in the background which is a problem when you try to understand the mechanics and the layout of the sub at the same time. For example it took me 3 tries just to understand how to increase my health. And the "how to play" gif really isn't helping, there's to much things to read and understand, and it loops too fast, so I have to wait for it to loop while ignoring the other frames not to get too confused. I ended up skipping it and got destroyed by the game. Cool game, also very hard. Initially I had a hard time finding where I could refill my needs, and finding out what refilled what. Controls were a bit too speedy for my taste, but it is stable. About the difficulty, a rebalancing would be due, as it is inevitable losing at some point. Art looks fantastic! The idea of using coffee to move faster at the cost of health is interesting and a good use of the theme. I'm not sure if all the management aspects are perfectly balanced, but I've never been very good at these games anyway. Where the game really shines are the visuals. The style is appealing and consistent, but there's a lot of detail and some nice animations. I would have liked some audio though. Thank you! I hope you get the message about drinking too much coffee. The audio will definitely be around in the post-game jam version. Again, thanks for playing and I hope you enjoyed it. This game is beautiful, altough it lacks sound. I really took long to figure out what machine keeps what resource, but after I learned about it, everything made sense from the artistic point (same colors for same resources). Nice job! I'm glad you figured out the color matching with its corresponding resource. You're the first person who noticed it. Thanks for playing! Love it. This game has a lot more going on than it seems at first. I like the method of trying to keep things balanced, and it suits the theme. The art is great, wish it had audio. Congrats on accomplishing this in 48 hours. My son and I just finished your game but we were never able to beat it. I made it to like the middle of the second day and noticed that I did not have to mess with electricity as much but I still would end up dying. Give us some tips!!! lol Nice job completing the jam! Thanks for trying out Delve! I understand I definitely should've included a tutorial for the game. Haha. I like the art style and animations a lot :) . It could be a bit more intuitive, where to get what stat. But it was fun for a while. If you want to expand it I hope you add a soundtrack. It could help so much with immersion. I completely forgot to add a tutorial or even just a how-to-play section in-game. I added a gif in the description to somewhat remedy this, but nothing beats the actual thing while you're playing. 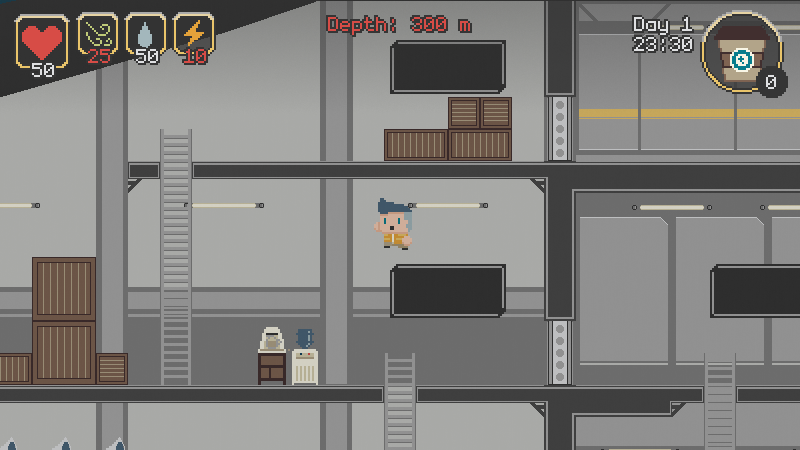 Music and sounds, a story and a tutorial are definitely gonna make it in the post-jam version. Thanks for the feedback! I did feel that you didn't have enough range when interacting with some items. With some I had to be touching them and if I was one pixel off it didn't work. Maybe just having larger collision areas might solve this. Also would have loved to be able to scale the game as it was a struggle on my large monitor. I understand the small window scale issue. It's one of those things that due to time constraints, I wasn't able to implement well. Dealing with pixel perfect graphics certainly isn't easy. Pretty cute! Not such a fan of the "sims" type of behaviour (like, you constantly have something going in the red adn whatever you do will always have to work hard to keep anything above red) Also, I suggest you to have a thumbnail that showcases your game's graphics, they're not something you should be shy of! I'm still finding out how to record a gif without it showing the game at 1000x or -1000x speed. Will most certainly do! Beautiful looking game and great concept. I got into a good rhythm for a while there but no one only drink coffee forever. 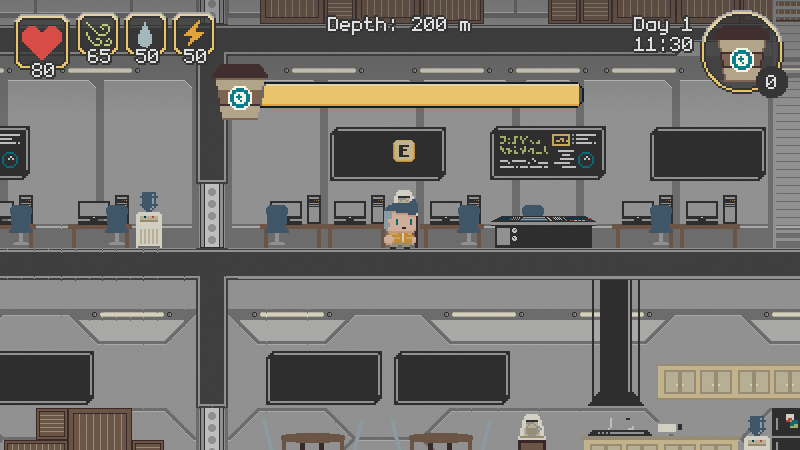 A platformer-management game about surviving in a submarine, with coffee at your side. Using GM:S 1.4 for 2+ years. Dabbles with code and art. You can check out some of my works on my itch.io page and my portfolio(?) site. Also Twitter.